This post was sponsored by Orgain, but all opinions expressed are my own. A few weeks ago, I woke up to a sleepy-haired five year old letting me know it’s time to wake up. I let him know that in just two short weeks, we would be driving to his first day of Kindergarten. We will be driving off to school…in two weeks…yikes! I have about 48 forms yet to complete, a schedule to work out, and a school supply list four pages long. Also don’t forget a lunch and snack plan to work out that feels more like planning a conquest of England…yikes again! School lunches look more like the TV dinner commercials of decades ago – entirely void of nutrition (and color). You could try to make up for the 2/3 of daily food intake consumed as processed garbage, or you could choose to plan and pack something better. Save yourself the sick days, and make a school breakfast, lunch, and snack plan for your children (and you) now! Pack Picky. Because proper grammar requires proper protein. I have been doing this pack-all-the-food thing for a few years. Let me share with you what I have found that works best for me. Breakfast: Grab one fruit (bananas are best for energy and easy for car-eating) and one protein-packed smoothie or shake. Snack 1: Grab one fruit or dried fruit bag or bar, and another shake if still hungry. Snack 2: To avoid the midday energy slump, grab another protein-packed smoothie or shake, and another fruit or dried fruit bag or bar. Finally, round out the day with a whole food dinner eaten as a family. Pack Picky. Brains can’t run on candy corn. Each Sunday, I do the math of how many snacks, smoothies or shakes, and lunches I need to pack. I turn on some upbeat music, and get packin’! When I grocery shop each week (before Sunday), I have a standard amount of veggies, fruits, shake mix, and other items to grab each week as “pack” items. I also have a go-to protein powder and shake I use throughout the week. This leads us to that ever-consuming question of what protein to pack. And just how do you find a protein that every member of the family likes? It may seem impossible, but I think I found it. Not only is it organic, but it also has pre-made children’s shakes (I know you just fainted). They offer plant-based and grass-fed options with awesome flavors. This magic company is Orgain. 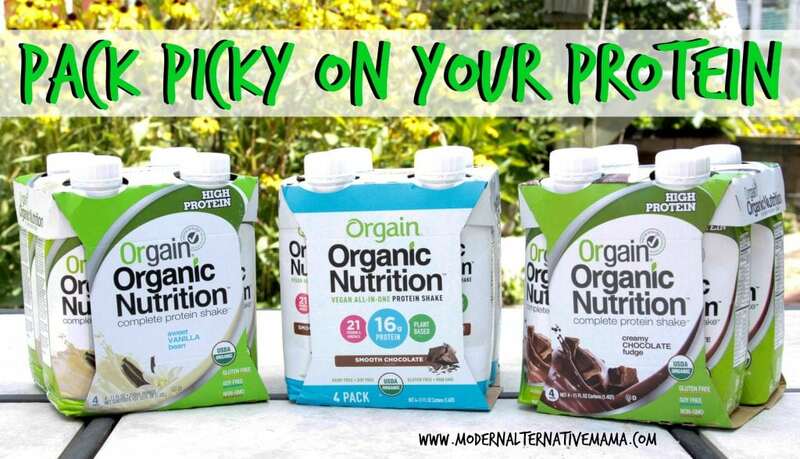 Orgain’s Organic Vegan Protein Powder has flavors that go way beyond your vanilla, chocolate, and strawberry. I personally like the creamy chocolate fudge (if you ever licked the spoon of brownie batter – this is what you’re dealing with), the vanilla bean, and the peanut butter. But, there is also iced matcha latte and a natural unsweetened flavor which can be added to any fruit smoothie. Orgain protein powder doesn’t have the grainy composition that others I have tried have. They also offer a Whey Protein Powder that has 21 grams of New Zealand sourced grass-fed whey protein. With all Orgain products, there is no sugar added and a complete amino acid profile. What’s maybe the best thing, is that they have pre-made shakes and even pre-made children’s shakes. Orgain has ready-made options for everyone, and in various flavors. They have vegan protein shakes and grass-fed protein shakes. Packing picky with healthy protein has never been easier. The ready-made Grass-Fed Protein Nutritional Protein Shake packs a punch with 20 grams of milk protein sourced exclusively from New Zealand. Their ready-made Organic Nutrition Plant-Based Protein Shake includes 16g of organic protein, an organic fruit and veggie blend, organic brown rice, hemp, chia, and flax. Orgain also offers almond milk, a superfood powder, a slimming powder, cold brew coffee, and protein bars. Load up on the protein powder to make shakes (or add to smoothies). Keep the pre-made children’s shakes on hand for when you have less time (or to keep in the car or the school!). But, what about you mama? Your nutrition is also important. You are the one managing, packing and ensuring that all of the soccer practices, math homework, and snacks are completed. I’ve found that the easiest way to ensure I get any nutrition is to follow the same plan I have set up for my child. That means I also grab a fruit and protein smoothie or shake as I run out the door for breakfast to drive to work or my child to school. It means that I pre-pack a veggie and protein-filled lunch for myself for work or in between school pick up lines. It also means that my afternoon snack is not from a vending machine, but another protein and nutrient-packed smoothie or shake! And finally, it means a whole food dinner together around a table with the little ones who make all this work worth it! So, pack picky for yourself, too. Because a to-do list with 73 items per day is impossible without real food energy. You can simply pack the protein powder, add water, and go! Or you can grab a ready-made shake or bar. But if you want to kick it up a notch and add even more punch to your protein, make a smoothie! Here is my favorite smoothie recipe. Blend all ingredients on medium-high speed for one minute. Stop, and scrape any peanut butter off the side of the cup. Blend another minute on medium speed. How do you meal plan for school? I’m surprised you would endorse a product with erythritol. From what I have read it is something to avoid.